Would you like some Bayer Heroin for that cough? How about some cocaine for that back pain? It sounds truly insane now, but for decades major drug companies like Bayer were peddling off diacetylmorphine (known as heroin) as a powerful pharmaceutical method of treating coughs, curing morphine addiction (seriously), and just about everything else. Better yet, virtually all of these products were proudly advertised in the prestigious American Journal of Surgery. Even following the subsequent ban on heroin being sold as a drug by Bayer after roughly 26 years of being sold to the public as a ‘scientific’ medical cure, drugs were created to mimic heroin and sold to satiate the rabid market for the heavily addictive drug. But Bayer’s heroin product is not the end of the truly ridiculous vintage Big Pharma products that dominated the medical community for decades upon decades. The creator of the first anti-depressant, which was removed in the early 60s due to extremely toxic side effects, Roche also had a popular product known as ‘Injectable Whole Opium’. 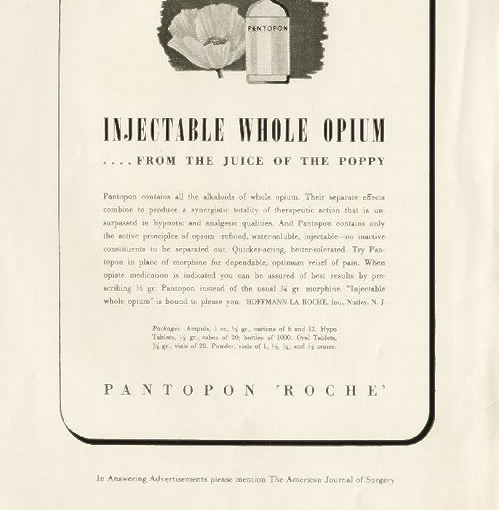 Displayed in theAmerican Journal of Surgery for readers to purchase, the injectable opium offers ‘dependable pain relief’ among other health benefits. The 1940s injectable opium ad states that the product is ‘bound to please you’. PreviousGuess How Many Millionaires Collect Unemployment…?